The Episcopal Church celebrates the feast of the Nativity of St. John the Baptist on Friday, June 24. Today the Rev. Alison Sandlin Liles shares resources for you to celebrate this feast at home. In April my husband and I celebrated our ten-year anniversary by spending a week in Italy, alone. It was the first time since becoming parents we’ve had this much time to ourselves without children or work responsibilities. Although we intentionally set out to talk about subjects other than children and work, they kept sneaking into our romantic getaway. I found prayers to share with my Episcopal Peace Fellowship members, we followed restaurant suggestions shared by my husband’s parishioners and discovered a scarf that seemed to be woven specifically for his parish administrator. We thought of our children in woodworkers’ shops, each time we ate gelato (9 times in 7 days!) and when we saw a mother teaching her young son to ride a bike in Rome’s Piazza Navona. The places where I did not expect to think of our children, Hill and Pailet, were museums and churches. This is where I was grateful to be without them, because it meant I could stand before frescoes, sculptures and paintings as long as I wanted without small hands pulling on my shirt asking if we could please, please, please go somewhere else. And yet, in every museum and church I found a fresco, sculpture or painting that I longed to share with them. Raphael’s portrait Young Woman with Unicorn and Caravaggio’s David with the Head of Goliath in Rome’s Borghese Gallery, Michelangelo’s magnificent horned Moses in St Peter in Chains and the many frescoes of Saint George triumphantly slaying fierce dragons. As we walked through The Church of Santa Croce in Florence on the last day of our trip I realized that nearly all the pictures I took were works of art I wanted to share with my children. 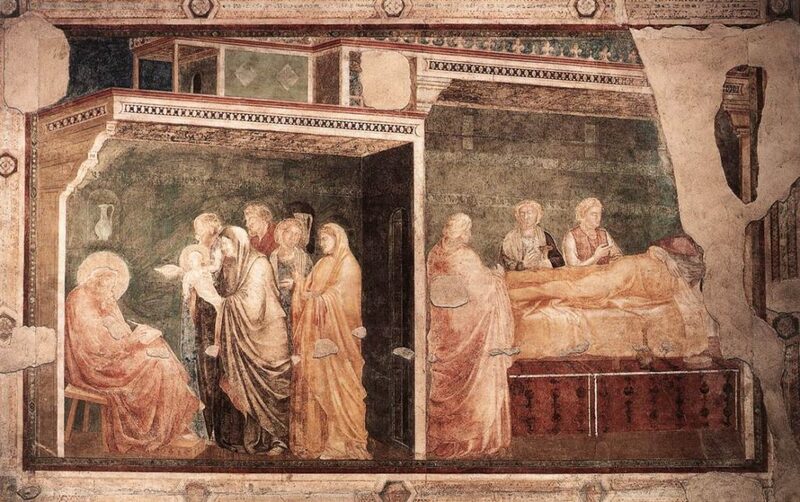 The Peruzzi Chapel within this church featuring Giotto di Bondone’s floor to ceiling fresco, “The Life of Saint John the Baptist,” was no different. From top: Annunciation to Zacharias; Birth of John the Baptist; Naming of John the Baptist; Feast of Herod. John the Baptist fascinates my kids so I started snapping away at the peeling painted walls of this small chapel. As I gazed at the scenes, John the Baptist’s life flashed before my eyes, and with good reason. At the top of the fresco Zechariah steps backwards, no doubt because he’s taken aback by the angel’s prophecy of a son. Just below is a side by side depiction of Elizabeth laboring in bed on the right and Zechariah inscribing the name given by God and delivered by Gabriel on the left. And finally at the bottom is the Feast of Herod in which a henchman presents John the Baptist’s head as if it were standard fare. But, where was everything else? Seeing as the painter named this fresco “The Life of Saint John the Baptist,” shouldn’t it include scenes from John the Baptist’s life? When I returned from Italy and showed Hill and Pailet the pictures from the Peruzzi Chapel I asked what was missing. The two of them pieced together most of John the Baptist’s life in a way that was fantastical and full of ingenuous insight. They certainly didn’t require a scene by scene fresco to visualize it. In their eyes John had evolved into a legendary figure, a perfect passionate prophet who made his parents extremely proud. As I listened I realized they actually sounded a lot like parents dreaming about the life that lies ahead of a newborn child. There are several ways to celebrate the Nativity of John the Baptist as a family. 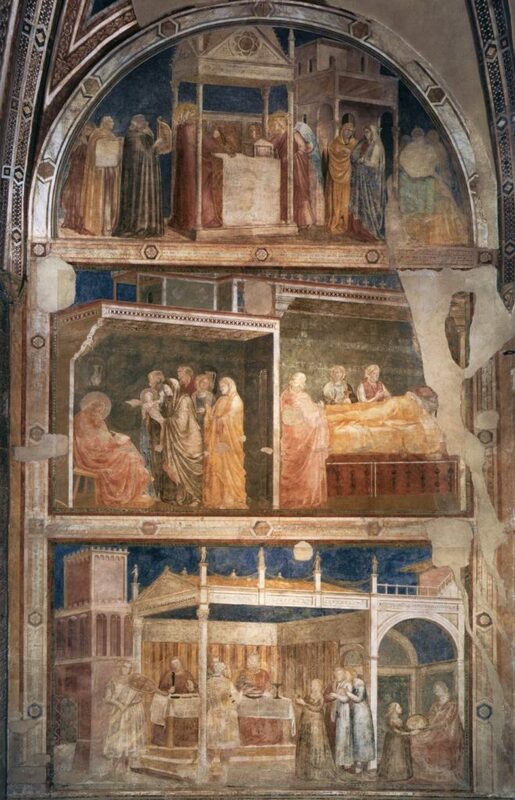 First, read Luke 1:5-25, 57-80 and look at Giotto di Bondone’s fresco, or at least the upper two-thirds of it. 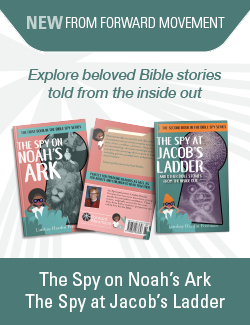 Wonder aloud what Zechariah and Elizabeth felt upon learning of the pregnancy and what plans they dreamed for their long-awaited miracle child. Second, share your own memories from the time you learned your children were coming into your life, how you chose their names and the dreams you created for them. 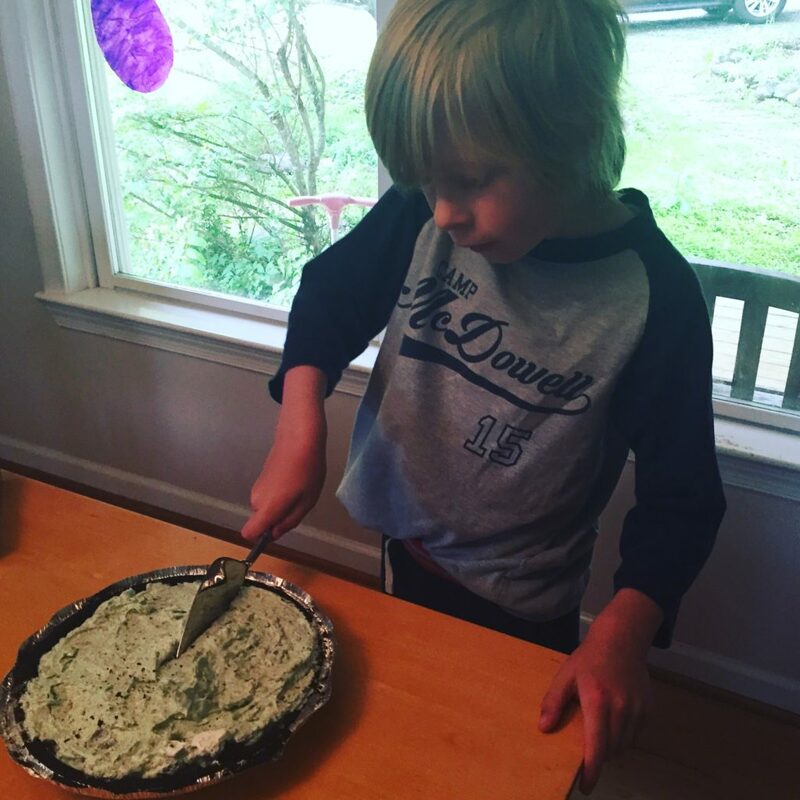 And third, whip up a child-friendly version of Grasshopper Pie! Mix one softened 8 oz package of cream cheese with one cup of sugar. Next fold in a dozen crumbled mint chocolate cookies such as Thin Mints ® or Keebler Grasshoppers,® along with a thawed tub of non-dairy whipped topping and a little green food coloring. Spoon into a chocolate cookie pie crust and refrigerate for at least three hours before enjoying. How do you celebrate the feast of the Nativity of St. John the Baptist? My children are 3 and 1… I’m guessing at this point they’ll mostly just remember the dessert: baklava decorated with grasshoppers (haven’t decided whether I’ll do real or fake ones at this point 😉 ) but we’ll also be reading JTB’s story from their children’s Bible. Personally, I would love to do grasshopper pie but alas, can’t have chocolate at our house. Great ideas though!